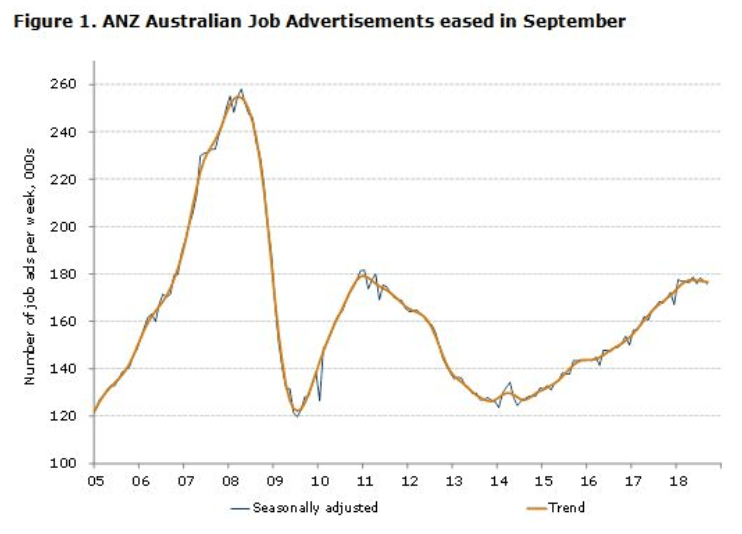 Monday 8th October – Australian Market Wrap | Beeks Downunder-Because not all financial news is boring! Hits 4-month low. China back online. US Colombus holiday tonight. High 6171 Low 6100. Modest volumes. Banks lead market lower as big miners cop a beating. Energy shares hit as profit-taking moves in. Aussie Gold positive at $1697. MSB +1.90% media write up. LYC +2.80% clouds clearing in Malaysia. MYO +19.13% private equity bid action. IAB +41.00% soars on the sale of business. TLT -7.80% letter to shareholders. CKF +3.57% ceasing to be a substantial shareholder. IVC -4.27% deaths are falling. APT -5.48% profit taking on FAANG sell down. CBA -0.93% Australian Post deal continues. A2M -0.31% CEO answers critics. MVP +12.24% signs an exclusive Penthrox deal in China. Speculative stock of the day: Biotron (BIT) +29.63% buyers return following successful Phase 2 trial results last week. Australia and New Zealand Banking Group (ANZ) –2.63% Have announced that the FY19 Cash Profit will be impacted by $374m in customer compensation charges and $206m of accelerated software amortisation expenses. The company’s FY18 Results will also include $104m in Restructuring charges and $55m of legal costs relating to the Royal Commission. FY18 Results will be released on 31, October 2018. Sydney Airport (SYD) –0.74% Have completed a ~$400m multi-tranche US private placement bond issuance with a debt maturities spread between 2034 and 2049. The company will use the raised funds to repay all drawn bank debt, increase their liquidity to cover future debt maturities and fund planned ongoing investment. St Barbara Limited (SBM) –1.89% Have entered into a $7m Earn in and Joint Venture with Australian Potash (APC) covering tenure at the Lake Wells Gold Project. SBM will pay a cash consideration of $1.25m to APC, as well as an exploration expenditure of at least $1.75m in the first year. After the first year, SBM has the option to spend a further $3.5m to take a 70% interest and receive a $0.5m reimbursement for prior expenditure. MYOB (MYO) +19.13% Have received a takeover offer from KKR, valuing the company at $2.2bn and paying 370c in cash. Bain Capital Abacus Holdings has sold 103,951,106 shares, representing approximately 17.6% of the issued share capital of the Company to an affiliate of KKR at a price of 315c per share. Together with existing interests in the Company, KKR has an aggregate economic interest in MYOB of 19.9%. Invocare (IVC) -4.27% The company has updated the market on the impact of lower death rates due to a mild winter and a better flu season. Deaths have declined by 5.9% across Australia meaning lowering funeral volumes by around 1.5% on Q2. IVC Funerals business has seen 2000 less services year to date. Around $17m in revenue hit to the bottom line. The company has been looking at ways to mitigate the effects by reducing its cost base. NEXTDC (NXT) -1.76% has advised it has agreed to terms with Asia Pacific Data Centre Group (AJD) +7.49% to acquire the remaining 70.8% of AJD securities it doesn’t currently own. The acquisition will be made via unconditional cash, on a market takeover bid. The current majority shareholder, 360 Capital Group, has stated it intends to accept the offer in the absence of a superior proposal. Once completed, NEXTDC would have a total interest of 96.5%. WorleyParsons (WOR) –1.03% Assiut Oil Refining Company (ANOPC) have awarded the company a four-year project management consultancy (PMC) contract for the new Assiut Hydrocracking Complex (AHC Project) in Egypt. China back online and plays catch up after a week’s holiday. China’s services sector picked up in September, growing at its fastest pace in three months even as manufacturing stagnated, according to a private survey. 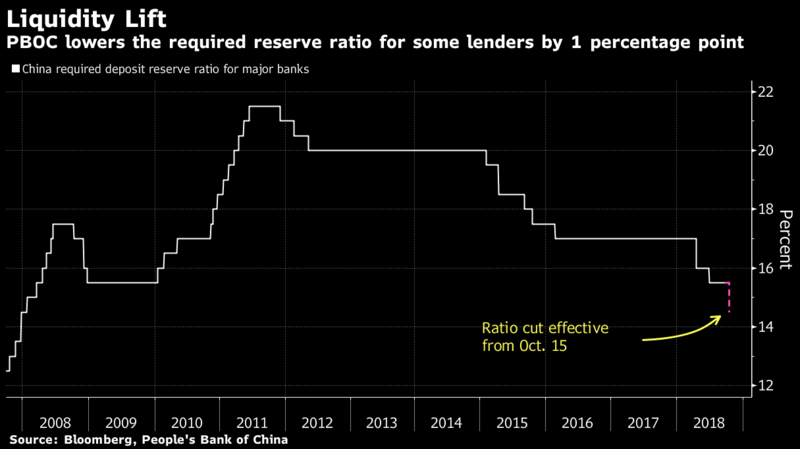 The PBoC lowered the Required Reserve Ratio (RRR) for some lenders by 1%, effective from Oct. 15. Growth in the world’s second-largest economy is forecast to slow this year to 6.6%. Japanese PM Abe needs to brush up on his geography as he has said he would welcome the UK into the TPP. Google could face a GBP3bn fine for a breach of customer data. The ‘Curse of Strictly’ has struck again. In the UK two stars of ‘Strictly Come Dancing’ have apologised after being caught kissing in public. Not the first romance to hit long term relationships on the show watched by 10m people. Taking a wee break from the golf course, Rory Mcllroy drives his new Mercedes into an Irish gas station. As Rory gets out of the car, two tees fall out of his pocket. “What are those things, laddie?” asks the attendant. “They’re called tees,” replies Rory. “And what would ya be usin ’em for, now?” inquires the Irishman. “Well, they’re for resting my balls on when I drive,” replies Rory.